U.S. Industrial Tool offers two different brake rivet tools for replacing small aircraft brake pads that use 1/8” rivets for pad installation. 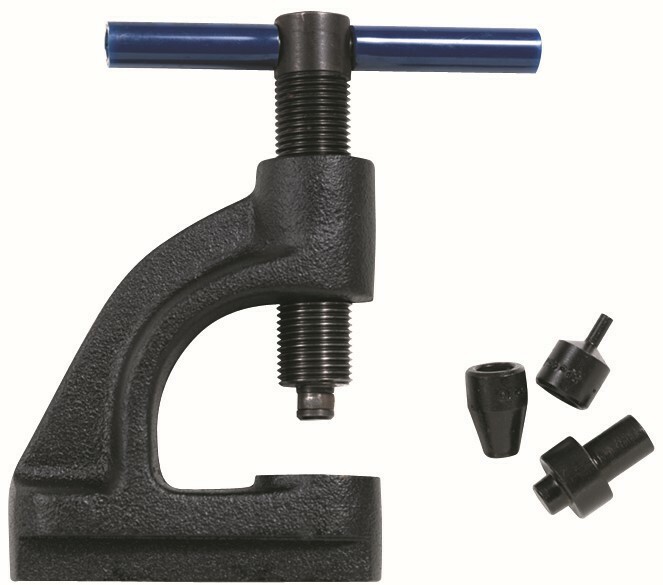 The TP95 brake rivet tool comes with a cast steel frame, removal punch, and rivet sets for 1/8” rivets. The TP95 is operated by the use of a hammer to strike the anvil and punch. The TP950 brake rivet tool comes with a heavy duty cast steel frame with “T” handle screw, removal punch, and rivet sets for 1/8” rivets. The TP950 feed screw helps to eliminate the possibility of damaging the pads and provides a highly improved method of removing / replacing your brake pads. Tool set comes in a plastic pouch. Cast steel frame designed to be mounted in a vice.